The US Federal Trade Commission (FTC) is cracking down on app publishers making exaggerated or false claims of medical evaluations. The FTC is currently disputing several marketing claims for apps that publishers say can detect melanoma. 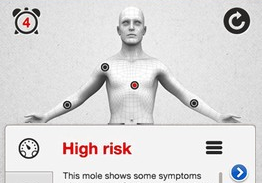 The apps instruct the user to photograph skin moles, then they evaluate the risk of melanoma and provide a threat rating. However, the government believes that these low-cost apps have little or no scientific evidence to back up their claims, and are likely to be of questionable benefit. The apps could misdiagnose or provide a false sense of security — potentially harmful in either case. The FTC points out that truth-in-advertising laws apply as much to app stores as to any other marketplace, and so publishers must have the data to back up their sales pitches. Two melanoma evaluation apps to come under the FTC's scrutiny include MelApp and Mole Detective, marketed by Health Discovery Corporation and L Health respectively. The FTC's ruling against these firms bars the companies from marketing apps with any unsubstantiated health claims, and both companies were ordered to pay fines. The FTC is also pursuing cases against other marketers of a number of other melanoma apps. Monitoring app stores for dubious claims will be a significant ongoing task for governments across the smartphone world. Left unattended, these apps could damage the concept of smartphone-based health monitoring at a time when beneficial healthcare and wellness-related apps are coming online. In the US, the Food and Drug Administration has jurisdiction over mobile medical apps — those which rely on external regulated sensors, evaluate hearing using a phone's built-in speaker or which analyse skin legions — and has established official guidelines for these. Low-risk apps like physical activity trackers tend not to be regulated. Apple, Google, Microsoft and other store owners should welcome such government scrutiny. App developers will need to distinguish between the healthcare and well-being realms, but regulator stamps of approval is a drive towards medical legitimacy for mobility.